Roots and tubers are known as extremely rich in nutritive substances vegetables. Because these vegetables grow underground, they absorb a great amount of nutrients from the soil. 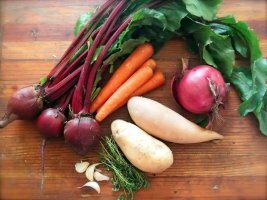 Root vegetables prevent diseases, strengthen immunity and give energy. Most tubers and roots are great sources of vitamin C and other vitamins and minerals such as calcium, beta-carotene, vitamin B6, phosphor, vitamin B. Sell and buy roots and tubers on Export Portal - take advantage of secure and effective trade! Potatoes are considered the most accessible and user-friendly tubers, beets are one of the healthiest root vegetables in the world and carrots are the most popular roots because they can be eaten raw. Selecting good root vegetables is easier on Export Portal, as we provide certified products from verified sellers! On our website browse a wide range of root and tuber vegetables such as potatoes, carrots, beets, parsnips, turnips, rutabagas, ginger, onions, garlic , radish, daikon, celery root, etc. Turn your roots and tubers market into a profitable business with Export Portal! Shop the best root vegetables and other food products from worldwide!